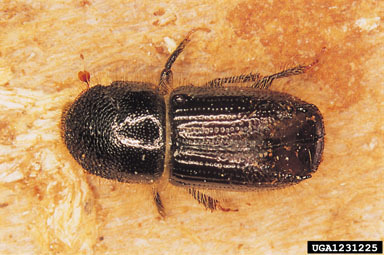 The European spruce bark beetle is considered to be one of the most destructive pests of spruce on the content of Europe. Several fungal pathogens can be transmitted to spruces by this invasive beetle. One of the most damaging is a species of blue stain fungus, Ophiosotoma polonicum, which can kill healthy trees by hindering the upward flow of water. To date, it has not been found in Wyoming. One hundred thirty traps have been placed throughout nineteen counties in Wyoming since 2008. The European spruce bark beetle survey is conducted by the Animal and Plant Health Inspection Service, Plant Protection and Quarantine. A Lindgren funnel trap with host attractant is placed on or near the host plant from May until September. If suspects are found they are sent to a regional entomologist for further identification.